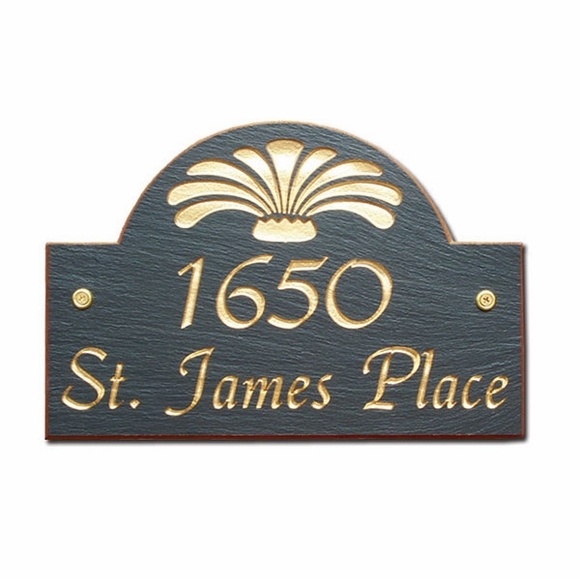 Personalized Slate Address Plaque with Script Font - - and bold, eye-catching design on the top. Arch shape, two-line address sign with your house number and street name. Two sizes: 8" x 12" and 10" x 14". Line 2 holds up to fifteen (15) characters (including spaces). On the 8" x 12" sign, characters in line 1 are 3", and characters in line 2 are 1.25". On the 10" x 14" sign, characters in line 1 are 3.5", and characters in line 2 are 1.5".